Bertrand Russell | Vorwärts und nicht vergessen! 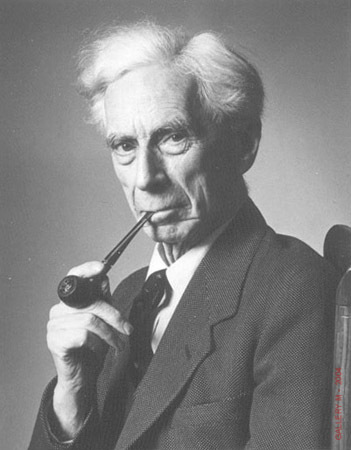 Bertrand Russell was born May 18, 1872 in England. „A good world needs knowledge, kindliness, and courage; it does not need a regretful hankering after the past, or a fettering of the free intelligence by the words uttered long ago by ignorant men,“ Russell wrote. „Bertie“ to friends, Russell, during his 97 years, did all he could to add to human knowledge and to inspire kindness. His second wife, Dora Black, called him „enchantingly ugly.“ The New York attorney who won a suit to void Russell’s appointment to the philosophy department at the College of the City of New York in 1940 because of his liberal views, described Russell as „lecherous, libidinous, lustful, venerous, erotomaniac, aphrodisiac, irreverent, narrow-minded, untruthful and bereft of moral fiber.“ „What I wish at bottom is to become a saint,“ Russell once admitted, but he couldn’t help being pleased by the label „aphrodisiac.“ The mathematician (who called his first encounter with Euclid „as dazzling as first love,“ Autobiography), philosopher and social activist authored 75 books. He launched headlong into a life of radicalism in his forties as a pacifist opposing World War I. He liked to recount his experience at prison, where he was sentenced for his pacifism: „I was much cheered on my arrival by the warden at the gate, who had to take particulars about me. He asked my religion, and I replied ‚agnostic.‘ He asked how to spell it, and remarked with a sigh: ‚Well, there are many religions, but I suppose they all worship the same God.‘ This remark kept me cheerful for about a week.“ (Autobiography) Russell spent his last years courageously working for nuclear disarmament. In „The Faith of a Rationalist,“ broadcast by the BBC in 1953, Russell observed: „Cruel men believe in a cruel God and use their belief to excuse their cruelty. Only kindly men believe in a kindly God, and they would be kindly in any case.“ One of his maxims: „Never try to discourage thinking, for you are sure to succeed.“ Russell won the Nobel Prize for literature in 1950. D. 1969.
and ALL of the links in log file was working perfectly. I ordered only 10K links but they provided 12500. What an amazing xrumer service. No other xrumer service can stay even close. This is most powerful backlink service ever I have come accross period. Thank you for your resource! I really respect what you’re doing here.